The allure of the deep blue waters spanning beyond the horizon has had many romanticize about it and lead them to adventures on the high seas. The fathomless depth and seeming peaceful surface seem to be hiding in its bosom countless mysteries. How happy is the sailor's life, from coast to coast to roam; in every port he finds a wife, in every land a home. Far beyond the human civilization surrounded by miles and miles of water as far as you cast your eyes, the sea, is a perfect haven where things can be buried and lost in oblivion forever! Countless novels have explored these colours of the seas to weave stories which have taken us through stormy nights, reckless affairs, one eyed pirates and even more; over the years. 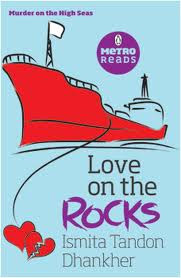 An addition to those, and a great one at that, is ‘Love on the Rocks’ by the very talented author Ismita Tandon Dhanker. There is nothing more enticing, disenchanting, and enslaving than the life at sea. The sailors spend weeks and even months on board huge ships far away from family with only liquor, work and the sea for company. Life on the blue waters has its charms no doubt but it leaves people longing for the touch of a loved one or sometimes totally disconnects them from feelings which lead them to darker corners of their psyche that they would otherwise never have explored. Men can form strong friendships while being for months on end with another while feeling a similar sensation of pain or they can get bitter with contempt and irritable at the slightest provocation. Ismita’s book sketches the story of the lives of people on one such ship and explores the equations between them; their relationships, their reactions and the tribulations after that. A newly wedded Sancha joins her husband Aaron on board a merchant navy ship, the Sea Hyena, looking forward to an exciting start to their lives together. What could be better than sailing with the love of your life towards the vast seas? Romance on the high tide would be the perfect start to their marital bliss or wouldn’t it? A not so perfect honeymoon overshadowed by two murders, a theft, devious characters, salacious secrets, doubts and suspicion turn the mundane sailing experience to one having the ingredients of a high voltage murder mystery and all these knitted together in a striking manner by Ismita. You can feel the moist sea breeze blow when you walk with Sancha onboard the Sea Hyena. You experience the pangs of her heart when she feels betrayed by Aaron. You sense the pain of Baldy at being ragged constantly as the mellow newbie. With Aaron you are in constant turmoil, you want to love him and wish he isn’t the wife hitting monster while still holding on to an affair of the past. You like the cheeky Harsh and the level-headed Raghav no less. You will love to hate the Captain too when the needle of suspicion falls on him. An author, who can lead the readers by hand through the story while making them feel each and every emotion that she wants them too, has on her hands a winner. Ismita too does that with remarkable ease. It is definitely worth a read. But there is more to this book than the murder mystery. There are certain aspects of the book that add to its charm; the two elegant poems and the fact that the story is told from each character’s perspective. Believe me it is never an easy job to pull off such a feat while still keeping the suspense intact. Well you would need to read it to believe it. Ismita’s book is a breath of fresh air; worth a read any day more so on a lazy Sunday afternoon with nothing exciting to do. So what are you waiting for, grab a copy now and set sail with Sancha towards the shore of Love on the Rocks! PS:All Pictures used in the blog posts are sourced from the internet.